Workers pump water from a flooded neighborhood back into a canal Monday in New Orleans. 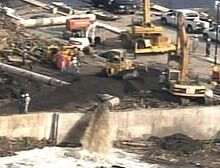 NEW ORLEANS, Louisiana (CNN) -- Even as the Army Corps of Engineers made progress removing water from New Orleans, the city's deputy police chief urged remaining residents Monday to get out because there was no power, drinkable water or food supply. Many New Orleans streets are still filled with stagnant, fetid waters streaked with iridescent oil and smelling of garbage, human waste and death. The failures of the levee system left about 80 percent of the city flooded with water up to 20 feet deep. Officials expressed concern that the conditions could lead to the widespread outbreak of disease. The military was considering using planes to spray for mosquitoes in areas where standing water could become a breeding ground for the insects, which can carry West Nile virus, an official told CNN. Deputy Chief Warren Riley told reporters that a week after Hurricane Katrina struck thousands of people insisted on remaining in "a hazard." "We are working with them to try to convince them that there is no reason -- no jobs, no food -- no reason for them to stay." He said the government "failed" the people in the coastal communities during that period and called for a federal investigation into the matter after the crisis subsides. The Coast Guard said Monday its air and water crews have rescued more than 22,000 people in states affected by Katrina. Some in New Orleans, however, rebuffed rescue workers who tried to convince them to leave. Floating on a car tire, a man who identified himself as Robert refused to climb into a rescue boat. "When this thing happened, you got people shooting each other," he said. "The only thing I trusted was my dog. I'm not going to leave him." Body recovery teams pressed on with the grim task of searching for victims, many of whom are floating in canals, abandoned on roadsides and still hidden in flooded homes. In Baton Rouge, Louisiana Gov. Kathleen Babineaux Blanco said the death toll from Katrina could reach "several thousand." Only 71 bodies had been collected by Monday evening. While mortuary teams moved out to locate the dead, the main focus of the police was still rescue operations, Riley said. Orleans Parish Sheriff Paul Valteau said the addition of troops and National Guard was a godsend. "There's just a lot of water in eastern New Orleans, more water than we're capable of dealing with," Valteau said. "So it's going to take the troops." Some 51,000 troops -- 38,000 National Guard forces and 13,000 active duty forces -- have been deployed in Louisiana, Mississippi and Alabama. Riley said that despite the horrid conditions, New Orleans was seeing improvements as rescue efforts progressed and police were bolstered by the arrival of National Guard troops. Riley said his officers "have been through hell" and that about 400 to 500 have not been accounted for. "Some we understand -- they're searching for family, they lost their homes," he said. "Some left because they simply could not deal with this catastrophe." Police superintendent Eddie Compass defended the performance of the force as "heroic." "The human sacrifice that this police department made is unprecedented in the annals of our country," he said. A steady stream of cars entered the parish after authorities agreed to let people return for the day to look at the damage to their homes. People had to leave by 6 p.m. (7 p.m. ET) and were told to bring everything they might need with them. President Bush met with Blanco and other officials Monday in Baton Rouge, headquarters of relief efforts in Louisiana. He also visited the Bethany World Prayer Center, a church that has been helping evacuees. Bush then took off for Poplarville, Mississippi, where he told a group of community workers assisting in relief efforts that he believes the region will be rebuilt. The president toured Biloxi, Mississippi, and New Orleans last week. In Mississippi, the death toll stands at 161, according to the state's emergency management agency, but that toll is expected to rise. In a meeting with Bush, Sen. Trent Lott demanded more help for Mississippi and called on the president to authorize sending to his state 20,000 trailers he said are "sitting" in Georgia. "Mississippians are homeless, hungry and hurting," a statement from the Republican senator said. FEMA has taken over and put on hold an airlift operation Texas initiated to send displaced persons to other states, Texas Gov. Rick Perry said in a statement on his Web site Monday. The agency is reviewing how to best handle the influx of evacuees to Texas, which Perry said Sunday had reached 230,000. The American Red Cross, meanwhile, said the largest response to a natural disaster in its history has provided housing for more than 130,000 people in 470 shelters across 12 states.